In a large skillet brown ground beef. Drain well. Add taco seasoning mix and prepare according to package instructions. Heat taco shells and tortillas as package directs. 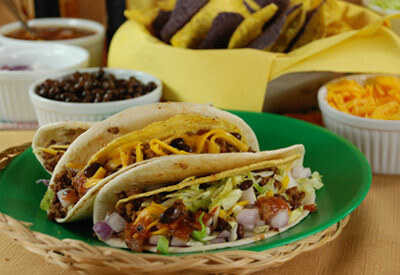 Wrap a flour tortilla around a crispy corn taco shell and add meat. Top with onion, tomato, beans, lettuce, cheese, sour cream and salsa.